OVERVIEW: Everything you believe will be changed this January as Lionsgate releases The Last Exorcism on Blu-ray Disc Combo Pack (two discs including Blu-ray and DVD - as well as code to download a Digital Copy). The film will also be available on DVD, Digital Download and On Demand. This clever, bone-chilling film comes from a collaboration of minds – rising director Daniel Stamm (upcoming M. Night Shyamalan’s Reincarnate), as well as all-star horror producer Eli Roth (Cabin Fever, Hostel, Hostel 2) and the producers of Dawn of the Dead. Hailed as “Scary, gripping and very intense!” (Access Hollywood), The Last Exorcism was a festival favorite chosen for the LA Film Festival, Toronto After Dark, Fright Fest and others throughout 2010. The film tells the story of a charismatic preacher expecting to perform a routine “exorcism” on a disturbed religious fanatic but instead he encounters a true evil far beyond his wildest imagination. 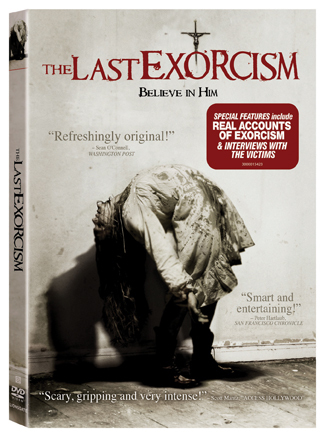 Both the Blu-ray Disc and the DVD provide a deeper look into the film with two commentaries from the actors, director and producers; a “making of” the film; the 2009 Cannes Film Festival teaser trailer and a featurette that examines those involved in real life exorcisms. The Blu-ray hosts exclusive bonus materials including an additional commentary containing stories from a spiritual warfare counselor, a “haunting” victim and a clinical psychologist; audition footage from Ashley Bell and Patrick Fabian and the theatrical trailer. “The scariest movie of the summer!” (WABC) heads home on January 4th. SYNOPSIS: After years of performing “exorcisms” and taking believers’ money, Reverend Cotton Marcus (Patrick Fabian) travels to rural Louisiana with a film crew to document what is to be his last so he can dispel what he believes is the myth of demonic possession. The dynamic reverend is certain that this will be another routine “exorcism” on a disturbed religious fanatic but instead comes upon the blood-soaked farm of the Sweetzer family and a true evil he would have never thought imaginable. FILM REVIEW: If you’re up for a horror film that will make you cringe, scream, cover your eyes every split second, and make you want to go home and sleep next to your mommy, then this is not the movie you want to see. This is the complete opposite of what you would expect from a horror film especially being classified in the same genre as The Exorcist, it slightly upholds the stature of the other films. The writer’s intent to define this film differently by means of portraying the main character, Reverend Cotton Marcus, as an individual who is humorous which is conveyed through questioning his own faith, creates a unique comical tone to the storyline. At the same time, it depicts the credibility and morale of an imperfect human being, that chooses to lead his life and preach in the name of God, in which is readily reflected in today’s and historical times of religion. Reverend Marcus’s faith is put to the test through his own documentary over his disbelief on exorcism. He randomly selects a distorted family living on a Louisiana farm as his subject to prove a point over exorcism while extorting money at the same time, however, throughout his visit he slowly ironically discovers what he was patronizing to become a reality. The setting, storyline, and characters of the movie were perfect and had the potential to create a spine chilling film. Unfortunately, having the greatest tools doesn’t automatically give you an award winning film unless you know how to exercise them. The plot leads to a disappointment, desperately wanting an ending to have more of a message or ironic judgment. Instead, the viewer is left with a horrible ending leaving one to believe the writer did not know how to end the story or basically production was cut short. In short, even though some parts of the film did have its highlights of neck cringing disturbing moments compared to the original exorcism film where till this day I have images of the creepy little girl embedded in my head, it is forgettable the minute you walk out of the theater.